120 Minute Fire Rated @ 1875˚F and 1/4 inch steel reinforced steel bolt down holes.–Steel Reinforced top long shelf with steel shelf clips to prevent warping or breaking. 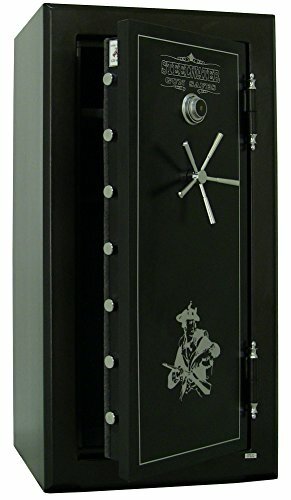 2 Hours of fireplace protection at 1875°F Maximum 22(11/11) long gun capacity (Average Capacity: 14-18 long guns) Exceeds California Department of Justice regulatory standards for gun safes Composite constructed 5 ¼” thick door that includes a ¼” solid steel plate. Door opening: Height: 49″ Width: 20 1/16″ 9 Gauge steel constructed body with an added ¼” steel plate on all the door. Total of (18) 1 ½” diameter solid steel locking bolts, (11) chrome plated active bolts, with an additional (7) inactive bolts on the hinge side for a total of (4) sides of bolt coverage Gear driven lock and bolt system for added strength against punch attacks, pry arracks and drill attacks. 8X larger Drill/ballistic resistant hard plate to give protection to the lock, gear drive, relocker and vulnerable areas of the interior linkages from being drilled or manipulated. (2) Relocking Devices Semi-gloss textured powder coated black finish and polished chrome 5-spoke care for Heavy duty 1 ¼” diameter hinges. Heat activated expandable door seal that may be designed to seal out smoke and water within the event of a hearth. (1) Pre-drilled ½” diameter hole for the installation of a dehumidifier (4) Pre-drilled ½” diameter anchor holes with 1/4 steel reinforcement plates for extra security when the protected is bolted down to the ground. Fully upholstered grey interior that includes a two-section gun rack that may store a maximum of (11) long guns within every section and includes (4) adjustable/removable shelves for additional storage options (1) Full length shelf – Width: 25 ¾” Depth: 16 ¼” (3) Small shelves – Width: 12 ½” Depth: 16 ¼” (These shelves can be utilized only in the appropriate component of the gun rack.) FREE DEHUMIDIFIER !!!!! Free Dry Pack – 450 gram silica gel rechargeable dehumidifying box FREE SHIPPING !!!! !Should have the ability to settle for full size tractor trailer on the end of the driveway. Call for shipping options. Read Disclaimer or call for details. 120 Minute Fire Rated @ 1875˚F and 1/4 inch steel reinforced steel bolt down holes.–Steel Reinforced most sensible long shelf with steel shelf clips to stop warping or breaking. PLEASE READ BEFORE PURCHASING: Undeliverable to New York with zip codes beginning in (one hundred-104) & (110-119), some remote areas such as islands, areas accessible only by toll bridge or ferry service, union states, and the like. Please contact us to make sure. THIS PRODUCT IS SHIPPED BY TRACTOR TRAILER. Please read over shipping details to stop delivery issues. Contact us for questions and/or other delivery options.